Learn to carve watermelon into beautiful works of art that will WOW your friends and family. Easy to follow watermelon carving lessons on video DVD gives you thorough step-by-step instructions on how to carve Watermelons in the Thai style. It is excellent for beginners who want to learn to carve watermelon and for intermediate carvers who want to refine their technique. Eliminate the frustration of learning by trial and failure. Get real time instructions and advice on clear high quality video. 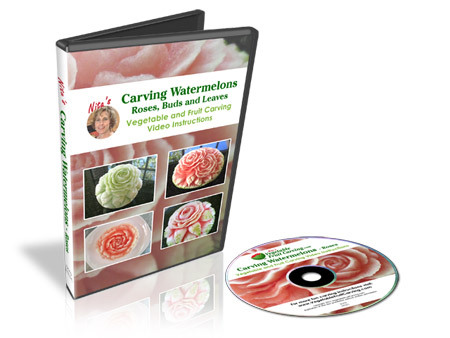 Detailed 97 minute step-by-step video instructions will show you the secrets of carving graceful delicate petals (3 styles), leaves and rosebud patterns. You will see common mistakes to avoid and how to fix them. You’ll learn how to keep your melon carvings fresh and much more. I’ll teach you the same way that I learned how. I was taught by looking over my teacher’s shoulder while she demonstrated how. Then I practiced what she showed me. You can learn the same way. This video is like watching over my shoulder. What is even better about the lesson on video compared to a live teacher, is that you can watch and rewatch the video at your convenience. Even years from now, if you’ve forgotten, you can always relearn by watching the video again. With that in mind, the DVD is divided into chapters to make it easy for you to find any section that you may want to review. Here are the chapters that you will find in this DVD. Getting Started with the Basics – how to comfortably hold your melon in place while carving. Tools that you will need. Two options for peeling and two options for carving. Advantages of two different fruit carving knives. How the thickness of the rind will effect the look of your carved roses. How to carve your petals for a delicate graceful look. Common mistakes to avoid when starting your roses and how to fix them. Making the inner petals of the second rose. Demonstration of some common mistakes to avoid that lead to a chunkier less attractive rose. Adding a third rose with jagged edged petals. Tip for new users of Thai style knife. Cutting out roses to use as garnishes or on top of a watermelon “cake”. 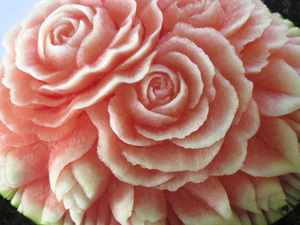 Carving rosebuds into your watermelon. Carving a honeydew rose surrounded by buds. Finishing the edges of your carved honeydew melon (smooth). Finishing the edges of your carved watermelon (zig zag). Positioning your completed honeydew and watermelon carvings for display. Variations of completed fruit carvings with rose patterns. How to store your carvings to maintain freshness. How long you can expect your fruit carvings to last. How they look a 1 day old, 5 days old and 6 days old. Nita’s closing words of advice. 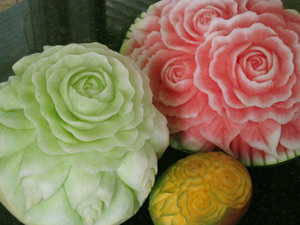 These stunning melon carvings are not difficult to do once you know how. After watching and carving along with the this video, you will be carving watermelons and other fruits with beautiful rose patterns. Your friends will be amazed! You will even impress yourself! to your lessons so that you can get started right away. Oh and by the way, this lesson is sold separately or as lesson # 11 in the Vegetable and Fruit Carving 101 – Eleven Week Course for Beginners. 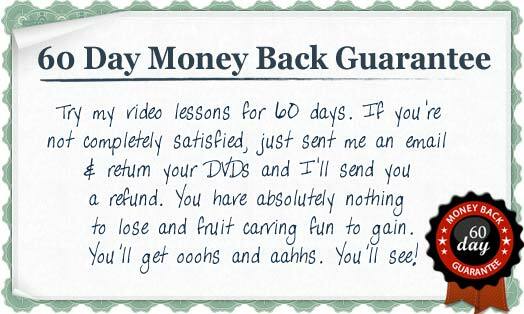 P. S. You will need a fruit carving knife for this lesson. The Thai Pro Flexible blade knife is the one I recommend for this type of carving because it is so very sharp and easy to maneuver like a pen or pencil. However, if you already have the Kom Kom fruit carving knife in the 3 knife set, it will suffice.